This two day tour will let you explore one of Scotland's most popular cities, at your own pace; go monster spotting by Loch Ness and see some spectacular scenery. This really is essential Scotland! This tour includes a trip on a steam train, a night by the banks of Loch Ness and the beauty of Glen Coe: essentially the very best of Scotland! From Edinburgh, we make our way north to the valleys, glens, rivers and lochs of Perthshire. We stop in Dunkeld in the heart of this wonderful scenery just in time for morning coffee. Find time to visit the impressive cathedral ruins on the banks of the River Tay. Just a short drive away is The Hermitage, one of the most picturesque landscapes in Scotland. We take an easy walk through large Douglas Firs to Ossian's Hall, an intriguing Georgian folly overlooking the Black Linn waterfall. Our coach tour continues with fine views of Blair Castle, the seat of the Duke of Atholl, the only man permitted to have his own private army, The Atholl Highlanders. The scenery changes to wilder mountain panoramas as we climb the Drumochter Pass, the main route since the earliest of times into the Highlands. We enter the Cairngorm National Park, a protected area of natural beauty, as we journey through the Spey Valley against the stunning backdrop of the Cairngorm Mountains. We next make a stop at Culloden Moor, the site of the last battle ever fought on British soil. Bonnie Prince Charlie’s Jacobite troops clashed here in 1746 with the British Army under the command of the Duke of Cumberland. After a bloody battle, the Jacobites were routed and Highland life was changed forever. After a hearty breakfast,we make the short journey to board the Jacobite Steam Train on the renowned West Highland Line for an unforgettable journey to Mallaig. This is one of the world's great train journeys and takes you past Britain's highest mountain, deepest loch, shortest river and most westerly station. We cross the famous Glenfinnan viaduct, featured in the Harry Potter films, and pass the monument to Bonnie Prince Charlie, who raised his standard here at the start of the 1745 Jacobite Uprising. There’s time for lunch in the fishing port of Mallaig before we head back to Fort William by train. From Glen Coe, we travel over Rannoch Moor, one of the most unspoilt areas in Europe, and descend the Black Mount with its views over Loch Tulla to our last stop in the Highland village of Tyndrum. The final part of our journey takes us through Rob Roy McGregor Country to the village of Strathyre, as the Pass of Leny brings us from the Highlands back into the Lowlands and Edinburgh. 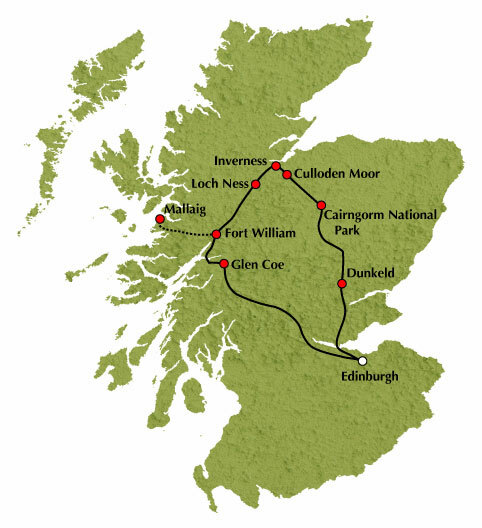 Tour Highlights: Dunkeld, Perthshire, The Hermitage, Cairngorm National Park, Culloden Moor, Inverness, Loch Ness, Drumnadrochit, The Great Glen, Fort William, Jacobite Steam Train, West Highland Railway Line, Glenfinnan Viaduct and Monument, Mallaig, Glen Coe, Rannoch Moor and Callander. A child discount of £10 applies to children aged 3 to 15 years inclusive at time of travel. We’re really sorry but children aged under 3 years cannot travel on this tour. Photo-ID may be requested to confirm discount entitlement.